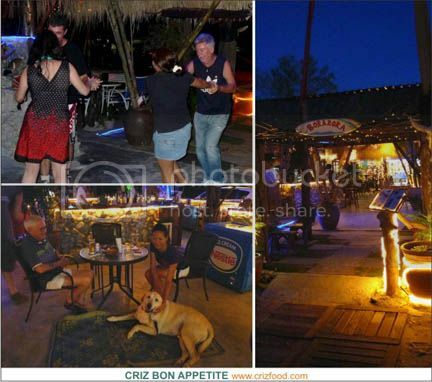 If you remembered the beautiful chill out place formerly call Sunset Bistro up at Bayu Senja, Batu Ferringhi area which was burnt down due to the so-called arson attack in late January 2011, you would surely not miss out the reincarnation of such cool bistro which now carries the name of Bora Bora By Sunset. A brainchild of Ms. Melynda Soon, the bistro was opened towards the end of May this year at a new location. It’s located just a shop lot away just before the Tarbush Lebanese Restaurant, hidden right behind some night market stalls along the famous Batu Ferringhi stretch. It has a better ambiance compared to the former with more cozy and dimly lighted corners for romantic couples. The bistro covers a long stretch of cemented pathways up to the edge of the beach, with an ejected wooden platform in between, to watch the beautiful sunset over the horizon of the Andaman Sea. Comfortable and uncomplicated, this snazzy bistro is actually a reminiscent of those smaller water holes by the beaches of some South East Asian countries. With an open rainforest concept, you are assured of cheap beers, reasonable priced beverages and a decent spread of cuisine, done in the simplest way to tempt any taste bud. 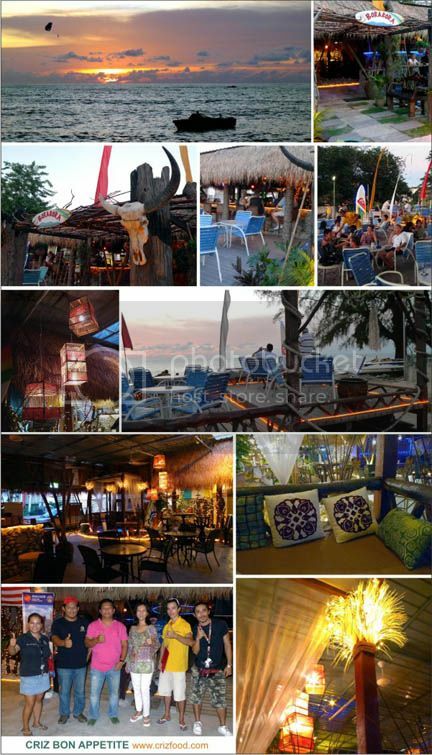 An uprising star on the night scene in Penang, Bora Bora By Sunset without fail has attracted a steady stream of regulars amongst the locals, tourists and expatriates. Even the workers there were all well trained to make the best out of your visit. Occasionally, there could be some well-heeled guests swinging and twisting out from nowhere. Are you sporting enough to put on your best dancing shoes and join in the crowd? After all, this would be the best opportunity to let your hair down and mingle with everyone. 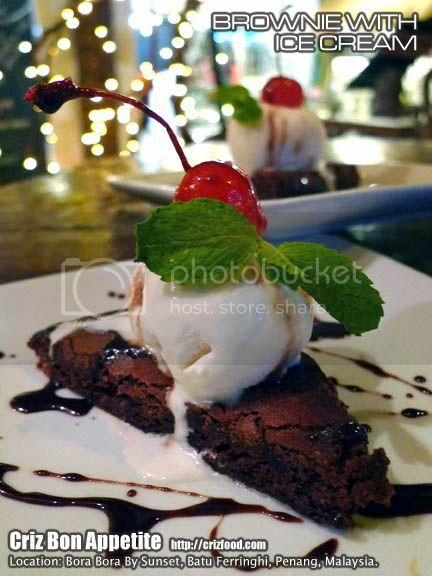 There would never be an ending to the choices of cuisine available here, ranging from light snacks, sandwiches, local food fares, spaghettis, pizzas to western cuisine and desserts. 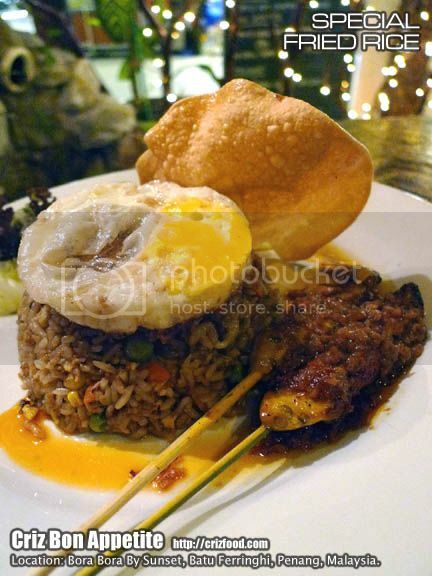 The Special Fried Rice (RM8.90nett) had a twist of everything Malaysian. The rice had a mild spiciness with chunks of chicken meat and prawns. The only thing that it lacked was that “wok hei” (high heat cooking) that the locals would love to have but the tourists just loved the way it was presented. It came with an Indian papadam, two big skews of succulent Malay satay, a sunny side up omelette and an assortment of fresh greens. Everything tasted well except that the kitchen should take note of the excess oil from the satay gravy. It made the rice a bit oily. 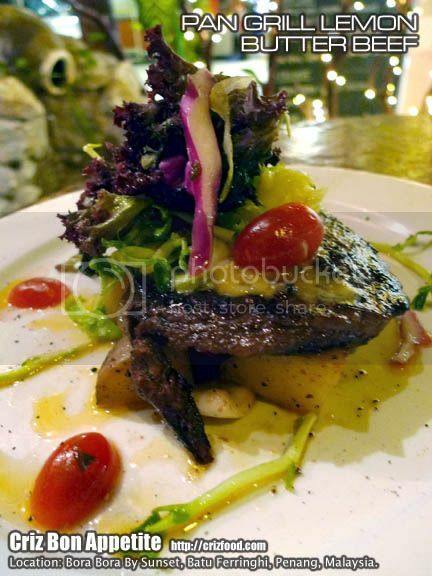 The newly introduced Pan Grill Lemon Citrus Butter Beef (RM31.90nett) had a touch of Mediterranean flavors. It had side dishes such as sautéed potatoes and fresh greens. The slight smoky flavor from the pan grilled beef, combined with the citrus butter with a touch of black pepper and herbs blended in well with the freshly handpicked greens. 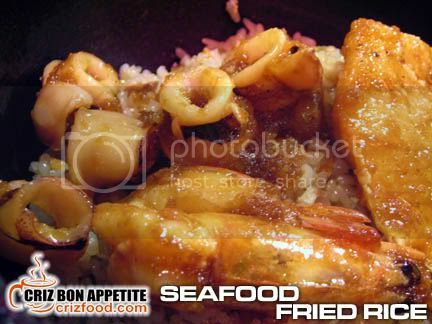 Although the dish was quite appetizing, in my opinion, this concoction would suit seafood better, preferably fish. Another thing that the kitchen should take note of would be the species of potatoes used. Certain potatoes imports such as those Australian or China ones are more suitable for deep frying or boil cook rather than being sautéed. Indian potatoes would be the ideal ones as they have that nice soft texture. 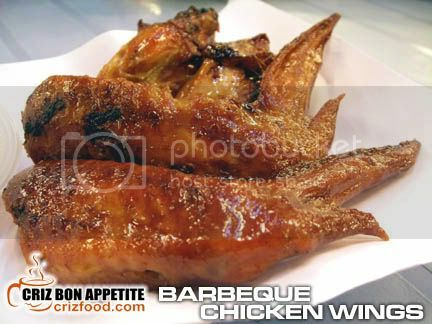 Diners’ choice of meat should also be considered here as some might not like their meat to be so well done. It should be a norm when ordering but somehow the waiter kind of forgotten about the importance of the diners’ preferences. 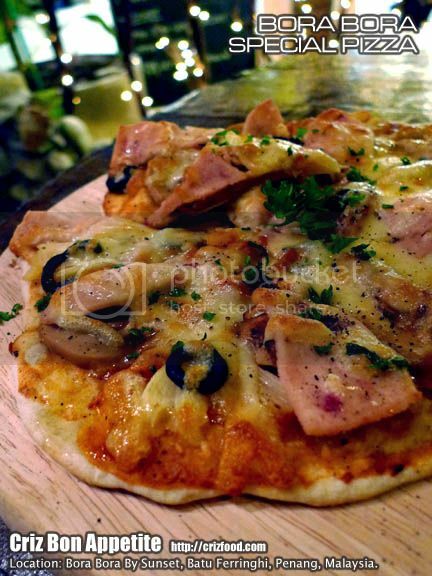 Pizzas… I always love thin crust pizzas or those wood fire ones. We ordered The Bora Bora Special Pizza (6” – RM12.90nett or 8” – RM13.90nett) which has turkey ham, pineapple, button mushrooms and olives. Compared to the dough for the pizza base from the former outlet, this one would need more experimenting. The base was rather compact and did not provide that mild crunchiness. Moreover, the pizza base sauce was rather thinly spread and did not have that distinctive tomato taste. On top of that, fresh pineapple cuts were used instead of the sweetened canned ones. There’s nothing wrong with that except that the kitchen should have chosen a riper pineapple and got rid of the harder parts. It did not flow smoothly with each bite. As for beverages, you can get just anything from coffee, tea, soda, fruit juices, lassi, milkshake, punch, cocktail, beers to any of your preferred hard liquor. Beer lovers would surely love this bistro as they have Skol (RM8nett per bottle), Anchor (RM9nett per bottle), Tiger (RM10nett per bottle), Carlsberg (RM10nett per bottle), Guinness Stout (RM12nett per bottle), Heinekken (RM13nett per bottle) or Corona (RM19nett per bottle) which ranges from as low as RM38nett per bucket to RM93nett per bucket. Paulaner is at RM26nett per bottle. 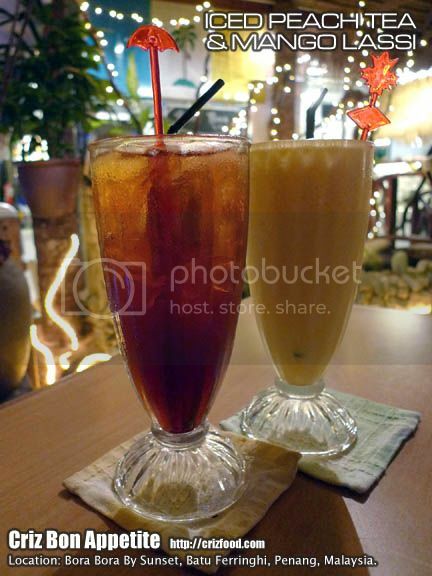 Well, we just got ourselves Iced Peach Tea (RM5.90nett) and Mango Lassi (RM8.90nett). With such a relaxing and stress-free environment combined with the ever friendly and fun-filled staff, it would be a great hangout place for just any ages. Moreover, all the items are at nett price. As for the food, there are still rooms for improvement since the newly appointed chief, Chef Mady Ahmad, just came in barely a week ago to revamp the whole kitchen. I guessed I may have to comment more on their food during my next visit. It might be a bit hard for foreigners to find this bistro as it would not be visible from the main road. But no worries as I’m going to show you some landmarks that would lead you directly to their door step. Just drive all the way up to Batu Ferringhi until you reach the traffic lights with Petronas petrol station at the junction. Further up would be Lone Pine Hotel on your right. Drive slowly and watch out for the tall Tarbush Lebanese Restaurant neon signboard on your right. Just before the restaurant is the Beach Corner Seafood Restaurant (Happy Mart Mini Market is just across the road). Park inside the car park (RM3 per entrance) and you would see a green gate on the right. Walk through that gate, turn left and you would see the bistro there waiting to greet you with open arms. With the dampness within such a humid weather, more and more people are falling sick due to their ignorance to monitor their consumption of greasy and spicy food. Symptoms would include fever, fatigue, insomnia, dizziness, nausea, loss of appetite and more. To build up our immune system, resulting from our almost unavoidable outdoor food intake, let’s have some herbal desserts. 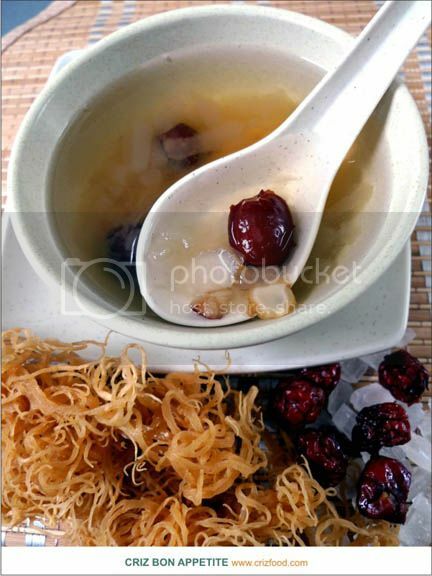 Let me share with you this simple SIX FLAVORS HERBS DESSERT WITH AMERICAN GINSENG recipe to lighten your body and to eliminate whatever dampness and heatiness within the body. According to the Traditional Chinese Medicine (TCM) practices, this combination of herbs has calming qualities and would help in eliminating body heaviness, chest tightness, sleeping disorder, strengthening the digestive system, lung in the case of relieving cough and retard aging processes. Mildly wash all the herbs to get rid of any existing dust. Add in 6 bowls of water and set to HIGH. When water boils, add in all the ingredients and simmer for 4 hours on MEDIUM-LOW heat. Stir in the rock sugar to taste. Serve hot as a dessert or a beverage. Bring the 6 bowls of water to boil on HIGH fire. Add in all the ingredients and close lid. When you hear the hissing sound from the pressure, bring fire to down to MEDIUM-LOW and cook for about 30 minutes. When the pressure is released about 5 minutes later, open lid, switch on your gas cooker and stir in the rock sugar to taste. Serve hot as a dessert or a beverage. Note: Surprisingly with such good business, this outlet has ceased its operation. All that was left is the Heritage Coffee. Many of you might not be aware the along the heritage stretch of Jalan Sultan Ahmad Shah (previously known as Northam Road) lies a cozy colonial building which houses two restaurants with pork dishes. The heritage building which was named as Hardwicke House would provide diners with two concepts of dining. On the ground floor there is the Heritage Coffee which offers a wide range of local, Chinese and Western fare for an informal lunch or dinner. The place caters to the younger crowds who enjoy the “chill-out” atmosphere. On the upper floor for this building is a smart and casual bistro called Sommerz Heritage Bistro with a wonderful heritage ambience, perfect for an inexpensive dinner over a glass of imported wine (starting from just RM55++ per bottle) or beers (Hoegaarden, Paulaner, Victoria Bitter, Erdinger, Corona, etc). We also did try out some of their exclusive dishes from the Sommerz’s ala carte menu such as the Sommerz Caesar Salad (RM12++). The salad has fresh romaine greens, mixed in their own Caesar sauce and garnished with real pork bacon bits and croutons and topped with a poached egg. The whole combination was perfect to start the meal off. The next was our favorite – BBQ Baby Pork Ribs (Half Slab – RM26.90++ or Full Slab – RM44.90++). This dish has been the top seller at Sommerz. The Texan recipe pork ribs had imported special ribs (not as oily as our local ones), carefully marinated and cooked until tender for that delicious taste. It came with sautéed onions, wedges and coleslaw. Next on the list was the Sommerz Rice Set (RM23.90++). This dish looked like a classier version of our local Nasi Lemak (Steamed Coconut Rice) but this version came served with Devil Pork Curry, Chicken Rendang, half a hard-boiled egg and Acar (pickled salad). I simply loved the creativity in this unique combination. Even the Acar complimented well with the dishes. The next dish which was the Devil Curry (Roasted Pork or Chicken – RM12.90++) is a popular spicy dish amongst the local Portuguese community. It had the touch of a family taste. It went well with some fresh buns and some beer or white wine. If you feel that these dishes are a bit heavy, you can even their Seafood Bisque in Bread Bowl (RM13++) or even some of their general dishes from Heritage Coffee downstairs. Some of the dishes that you can get from Heritage Coffee would be their tasty Char Koay Teow (Regular with 2 prawns – RM8.90++ or Extra with 4 prawns – RM12.90++). It was quite equivalent to those hawker stalls with that extra “wok hei” (high heat cooking). For that extra “kick”, do ask for extra chili. Another street food they served was the Hokkien Mee (Regular – RM8.90++ or Extra Prawns in a Claypot – RM14.90++) or commonly known as prawn noodles in other states. Although the soup had the flavor of slowly simmered prawn shells, it was not the thickness I preferred. The soup might need a bit of toasted belacan (shrimp paste – trade secret) added in. The claypot version had additional large prawns, hard shelled clams and squids. Both would taste better if some specially prepared hot chili paste were to be mixed into the soup. 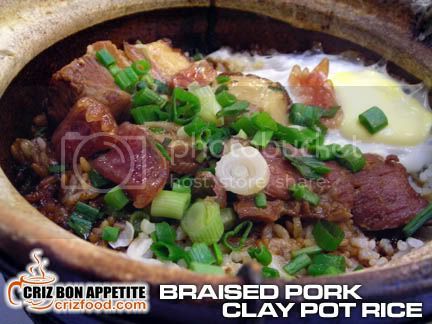 There was also the “Dong Po” Pork (RM22.90++), served in a mini rice bucket. 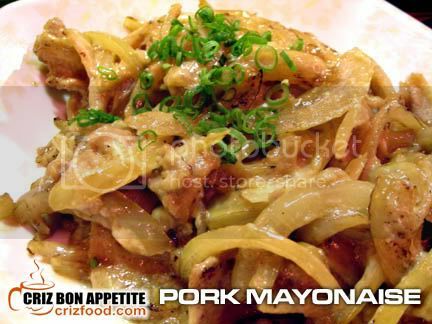 Pork belly meat would be wine marinated with a combination of spices, slightly fried and braised until the perfect tenderness. A piece of the meat in some gravy would then be served on steaming rice accompanied with some blanched vegetables and an omelette. I found the meat on that day was a bit too fatty and overcooked as there was hardly any meat on it and the fat just melted into the rice. The kitchen should take note on this. The Seafood in Claypot (RM33.90++ – for 2-3 pax) had a combination of fresh prawns, mussels, scallops, clams and squids in a spicy, sweet and sour soup. 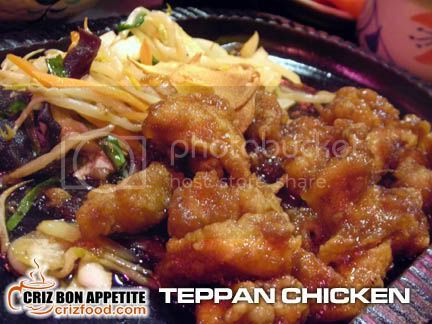 It has a strong hint of chopped lemongrass, kaffir lime leaves, garlic and chilies. This dish would go well with rice. 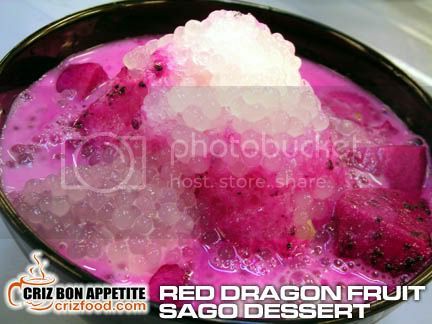 I find this Vietnamese-like dish a bit strong in the usage of sugar. I hope the chef would take note of this unhealthy over usage too. Their Seafood Aglio Olio (RM15++) had the right al dente for its pasta. I simply loved how they maintained the “wetness” by tossing enough of olive oil, chopped garlic, onions and bell pepper in it. The dish came with fresh mussels, prawns, squids and fish, garnished with some chopped coriander. Just a note here that you might get different seafood served based on their availability. Another of the hard-to-get in Penang dish was their signature Pork Burger (RM16++). The well flavored minced pork patty was cooked just right to maintain its juices within. This delicious cooked patty was presented on a fresh bun, laced with fresh lettuce, topped with an omelette, cheese and sautéed onions. The set came with some fresh greens and fries. They also have the Chicken Chop Burger (RM15++), served with some fresh greens and fries. The burger which has oozing mixture of tomato ketchup and chili sauce was just another way of having normal chicken chop. Other than that, you could also try out their Markpalia Chicken (RM18++). This quite similar to Cajun style prepared grilled chicken with praprika and herbs marinates, came with mashed potatoes and a mixture of blanched and sautéed vegetables. Somehow, I was over disappointed with strong recommendation as the whole dish tasted extremely salty. Moreover, the portion did not justify its price, considering that I was dining at the al fresco area. Their Roasted Pork Knuckle (RM53++ for 3-4 pax) was huge. You would need to wait at least 30 minutes for this dish to cook. The crispy skin and juicy pork knuckle came with two special dipping sauces and some fresh greens. They also serve Express Set Lunch as low as RM8.90 nett, inclusive of free flow soup (normally clear soup eg. Old Cucumber Soup, Watercress Soup, etc) and ice lemon tea. The set meal would only be available from 11.30am – 2.30pm on weekdays (Monday – Friday). I would say the set lunch was worth it considering that I could have as much soup and drink as I wanted. The Penang Char Koay Teow (RM8.90nett) was great. So was the Nasi Lemak with Rendang Chicken (RM10.90nett). The worth mentioning dish of my choice would be the Baked Cheese Rice with Chicken Chop (RM10.90nett). Instead of having some plain rice baked with cheese as some fast food chain would normally provide, it came with fried rice with ham cubes. The chicken chop baked with cheese was amazingly tasty. 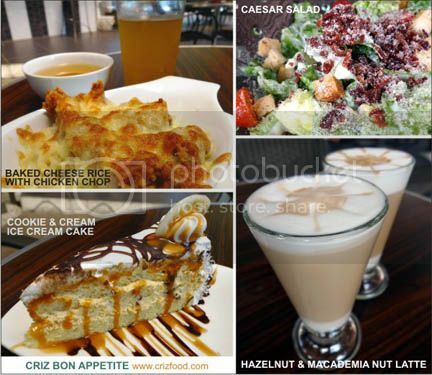 You can even order some Caesar Salad (RM9++) to share out if you are there with a group. The only differences between the Sommerz Caesar Salad and this salad would be the omission of the poached egg. If you feel that you would need a dessert after your meal, you could always try out their variety of ice cream cakes. I loved their Cookies & Cream Ice Cream Cake (RM7.90++) as it was chilled enough and simply melted in my mouth. The cake came with some caramel and chocolate dressing which was perfect for my liking. 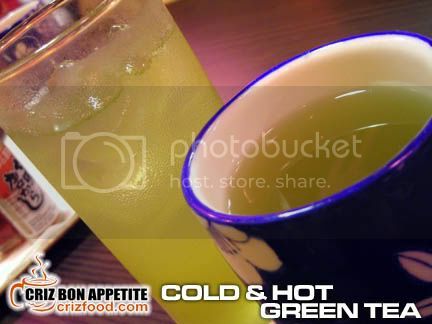 As for beverages, there are many types of hot and cold beverages for you to choose from, ranging from coffee, tea, chocolate, juices, milkshakes, smoothies, soda, beer to wine. I tried out their Hazelnut Latte (RM5.90++) and Macademia Nut Café Latte (RM6.90++). Both came light and frothy but I had a problem identifying which was which as both had the same nutty taste. 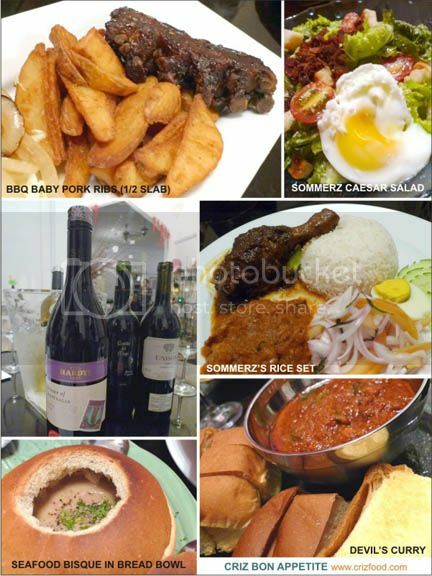 Overall, Sommerz Heritage Bistro can be quite a bargain for diners who love wine with their meals in a cozy ambience while listening to some nice music being played by a live band. Moreover, there’s the games room where you can have a game or two of pools and darting. The management would also be planning for a Sunday Champagne Brunch from as early as 11am soon. Do check up with them on any updates on the launch. 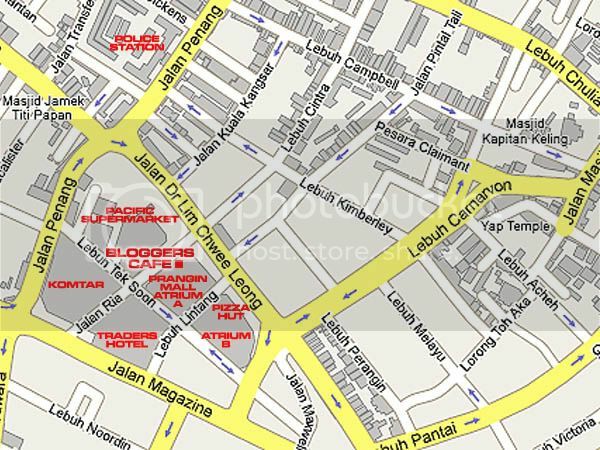 If you are coming from town along Jalan Burma, drive all the way until you see a “Y” junction. Left would lead you to Pulau Tikus. Right would lead you to Gurney Drive. Turn left into Jalan Pangkor (keep to your right). Immediately after you see Gleneagles Medical Centre on your right, slow down. Turn right into the service road and you would see a purplish building (Northam Tower). The restaurant is just in front of the building. You would not miss the colonial architectural building. 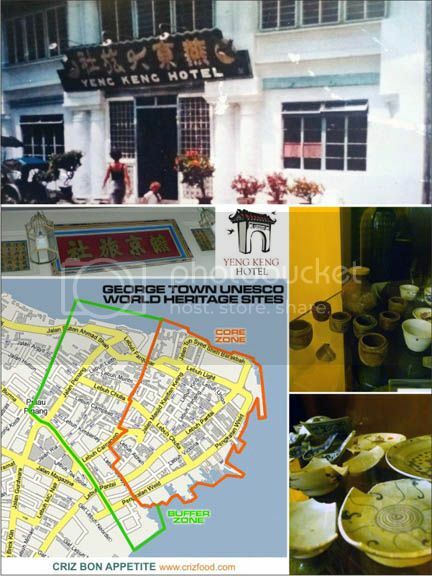 Within the buffer zone of the George Town UNESCO World Heritage Site lies one of the oldest surviving intact buildings in the historic enclave of Chulia Street, Penang. Originally built in the 1800’s as a private residence to Shaik Eusoffe bin Shaik Latiff, an Indian Muslim family, the unique Anglo Indian bungalow had gone through many hands, such as the trustees of the Cantonese Club ‘Yin Han Pit Shu’ and the Straits Chinese British Association, before being leased out to Yeng Keng Hotel in the early 1900’s. One main feature that remained distinctive from the rest of the buildings along Chulia Street (Lebuh Chulia) today is the unique Chinese architectural gate entrance and the many artistic murals scattered all over the premises. Some of the artifacts dated as far back as tens of decades ago can still be found here in the mini museum set up by the present establishment. With the conservation and upgrading efforts by the present owner, Hoo Kim Properties Sdn. Bhd. since 2009, the new Yeng Keng Hotel was completely refurbished in mid 2010. The new establishment has a mix of the past and present state-of-the-art facelift, with heritage accommodations, swimming pool and an al fresco area for dine and wine. The hotel is now managed by Mr. Jacky Chung, Hotel Manager and Mr. Tan Jie Yong, a seasoned chef who had traveled throughout a few Asian countries, cooking as well as lecturing Hainanese cuisine, as its Executive Chef. There are 20 rooms in this heritage hotel. The suite of all suites would be the Yeng Keng Suite (RM600+, Present Promotion RM500+). There are also 2 units of the Chulia Suite (RM500+, Present Promotion RM400+), 2 units of Family Triple (RM440+, Present Promotion RM380+), a unit of Garden Suite (RM440+, Present Promotion RM350+) and 14 units of others such as the Courtyard Doubles, Mansion Doubles and Courtyard Twins (RM380+, Present Promotion RM300+). A 10% service charge would be applicable to all check-ins which would include a quantity of American Breakfasts set by the management. Check in would be from 2.00pm while check out would be at 12.00pm. Just call in to check out on their ongoing promotions. As for food, there would be a mix of Western and Hainanese cuisine served here, with a note that some of the Hainanese dishes might need to be preordered earlier. Breakfast would be served from 8.00am until 10.30am. Lunch and dinner would be from the ala carte menu as early as 11.00am until 10.00pm. Presently, there’s the Hi-Tea Promotion at only RM7.00+. You get to have free flow of coffee or tea with a cake-of-the-day (eg, Apple Strudel, etc). The bar would open all day long until late. 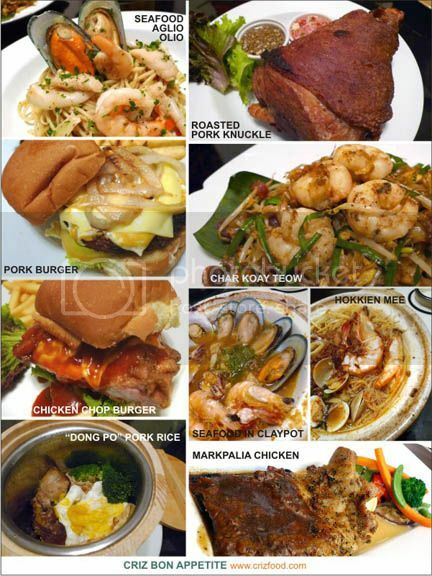 Here’s a peek at what are the dishes available in this hotel. 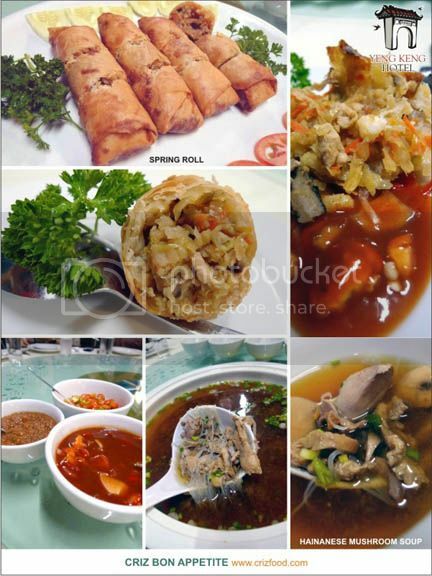 Firstly, there’s the Hainanese Spring Rolls (RM12.00+ for 2pcs or RM24.00+ for 4pcs). 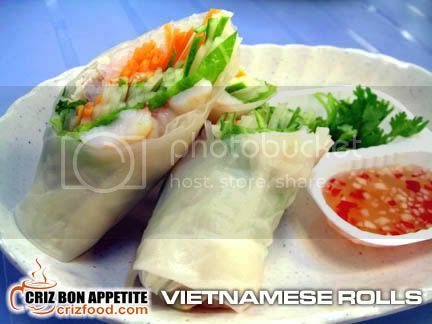 Each piece of the spring roll has stir fried cabbages, carrots, onions, mushrooms, chicken meat and crab meat. Although the rolls tasted nice, it came in a form rather moist compared to the ones I have tasted elsewhere. This could be due to the fact the vegetables were cut in strips as in Cuttle Fish Strips Stir Fry Vegetables (Jiu Hoo Char) instead of being cubed as in Sole Fish Stir Fry Vegetables (Phnee Hoo Char). A bit of diced water chestnuts added in would also be great for that extra crunchiness. These rolls were served with a condiment of a mixture of tomato ketchup, LP Sauce, sliced onions and chilies, a combination more suitable for Western diners. I would prefer mine to be served in the traditional way of herbed soy sauce, mustard paste (somewhat like LP sauce) and sliced chilies. The Hainanese Mushroom Soup (RM10.00+ per pax or RM45.00+ for 10 pax) was something quite similar to the Japanese Miso Soup with the usage of some blended fermented black beans. Instead of using cubed tofu, the Hainanese version has sliced button mushrooms, glass noodles, chicken meat and chicken gizzards. This dish would be suitable for those who love internal organs in a much clearer soup. 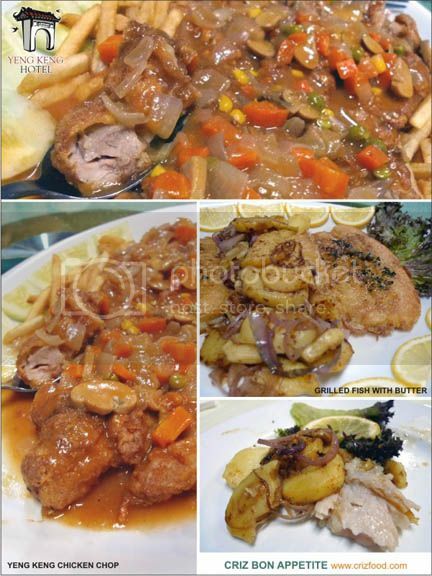 The Yeng Keng Chicken Chop (RM15.00+ per pax or RM30.00+ for 10 pax) was presented with crispy boneless chicken on a bed of shoestring chips and topped with mixed vegetables, cubed onions and sliced button mushrooms in some tomato base gravy. It tasted not bad but a bit too salty for my liking due to the over salty marinates. Moreover, frozen mixed vegetables were not my preferences due to the fact that they lacked the natural taste of fresh vegetables. The Grilled Fish with Butter Sauce (RM18.00+ per pax or RM36.00+ for 10 pax) was rather unique and tasty except it had a bit of marinate problem. Since it was served with salted caper pickles and butter sauce, the fish fillet should not have been marinated in salt. The outer batter coated part was fine except for the a bit salty fillet within. Maybe it was the hotel’s way of cost effectiveness, but I don’t quite fancy dory being used for this dish as it would not provide the juiciness as in other fishes such as the barramundi, mari mari or grouper. It would be great if the hotel would opt for these fishes (with different price tag of course). The sautéed sliced potatoes with onions went great with this dish. This is the type of originality that I love most when dining outside. The Braised Lamb Shank (RM35.00+ per pax or RM70.00+ for 10 pax) served with spaghetti, roasted potatoes and blanched vegetables was a great recommendation. The meat was tender and has the right ingredients used while braising. If only I could get them to add in a bit of red wine during the braising process for that extra flavor. 😛 There was also the Hainanese Style Chicken Pie (RM25.00+ for 3-5 pax or RM35.00+ for 10 pax with extra filling) which would require a pre-order of 24 hours. I always love dishes with butter brushed pastry. It had small chopped chicken pieces stewed with onions and shitake mushrooms (instead of button mushrooms), topped with mixed vegetables (again? sweat~) plus cut hardboiled eggs, prior to being laced with puffy pie pastry and baked to perfection. The dish was slightly different compared to the one I had in another Hainanese restaurant as it lacked the creaminess from some sliced potatoes and the sweetness from fresh carrots. The next dish was the Inchi Kabin (RM10.00+ per quarter chicken, RM16.00+ per half chicken or RM30.00+ per whole chicken), a common Hainanese household fried chicken served with crackers. Although the dish tasted not bad, it could be due to my spoiled habit of having mostly drumsticks in my meal as I found the chicken pieces a bit too dry for my liking. We were also served with Curry Tumis Tau Teh Fish (RM100.00 – RM120.00 based on market price). The Chinese Pomfret or commonly known locally as Tau Teh is one of the most expensive species in the pomfret family as it has thick, smooth and juicy flesh. The fish dish was nice but it was in a drier version due to the likings of the hotel’s guests in dipping with bread or served with rice. Unfortunately, it spoiled the quality of such an expensive fish as there were not enough liquid in the gravy to be absorbed into the fish. The flesh ended up a bit too dry. It would be better if black pomfret or even stingray (which can be arranged) be used for a lower price. This dish came with sliced lady’s fingers and tomatoes. 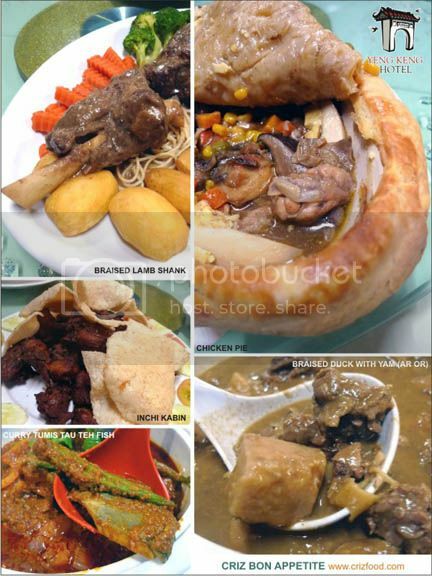 The next dish which was the Braised Duck with Yam (Ar Or – RM50.00+ per half duck or RM85.00+ per whole duck) also came in thick gravy compared to norm. It has a strong taste of sliced ginger. As for this dry version, it would be ideal to be taken with rice. Normally, most Hainanese would have this dish as a sort of soup dish. On top of the above few dishes for a larger group of people, you could always order other individual dishes such as noodles and rice from their ala carte menu. Their Hainan Mee (RM10.00+) was quite big a portion and tasty. Somehow, it looked darker just like the local Hokkien Char with the usage of dark soy sauce. I wondered if the chef got it right as the gravy should be quite similar to that of the more pale looking Fried Oyster Yellow Noodles. 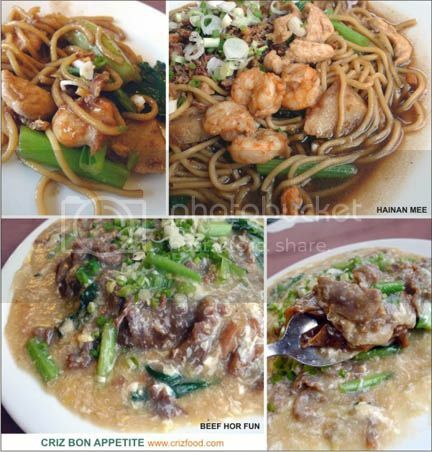 The next noodle dish consisted of another version of flat rice was the wet Beef Hor Fun (RM15+). It was also big and delicious. I loved the well marinated beef slices as well as the beaten egg enhanced flavorful gravy. As for dessert, they have some simple ice cream desserts but I went for something that has been quite rare in the dessert scene nowadays – the Bomb Alaska (RM20.00+). The dessert has 4 scoops of vanilla ice cream topped with some mixed fruit cocktail and wrapped in a layer of butter cake slices. This wrapped cake would then be sprinkled with some rum and covered with a layer of airy and slightly sweet meringue. The following process would be to burn some brandy over the meringue to create the lightly burnt taste. I found the dessert to be delicious if I leave it a bit longer for the ice cream to moist the cake well. If you consume the cake immediately after the fire is out, you might find the cake to be a bit too dry. As an option, it would be better for the chef to firstly moist the cake with a mixture of the fruit cocktail juice and rum or just add some soda (such as 7-up or Sprite just as how you would do it for the base of a truffle) with rum. At least this would have a consistent moist for the whole dessert. 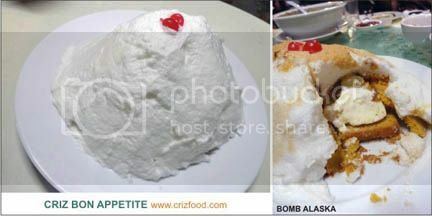 Unless you are there just for the Bomb Alaska, I would advise you to get at least 3-4 diners to share out this big dessert. Here’s the burning process video of the dessert. 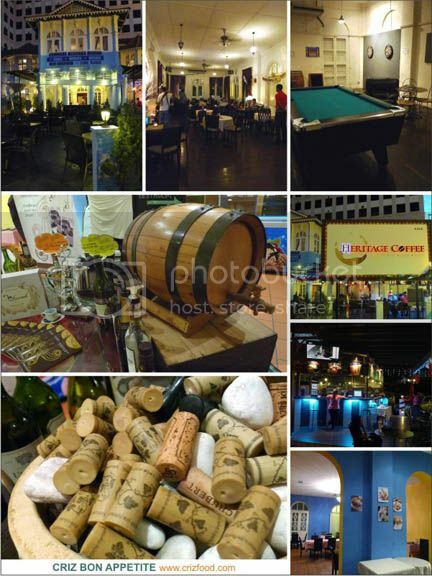 Overall, Yeng Keng Hotel is a nice place for couples and families. Not only are the rooms modernly equipped with state-of-the-art facilities, it also offers great heritage living experiences in a romantic and tranquil environment. Let’s hope the new restaurant would be constructed fast enough to draw in more crowds, thus having more choices as well as a higher standard in food quality. 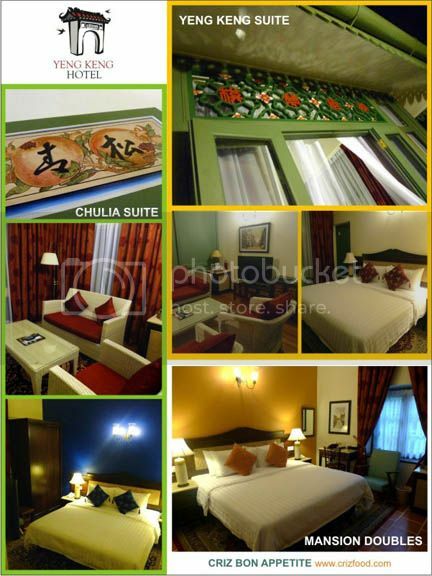 Finding the hotel won’t be hard as it’s the only hotel along Chulia Street with a beautifully constructed Chinese arch right at the entrance. If you are coming down from Cititel along Penang Road, just turn into the second lane on your left which is Chulia Street. Drive further for another 300m and you would see the hotel entrance on your left. Next to it is a guard house where you can get permission to park your car at the back of the hotel. There are limited parking spaces here. If you can’t get any car park within the hotel, just drive a bit further up and you would see a no through road next to Sky Hotel. You might find some parking spaces here. Cooking something sweet for dessert is surely more economical than buying from those available outside… unless you are too lazy to cook. LOL! As for me, I would almost always love to cook mine at home as it would give me the freedom to add in more ingredients to pep up the richness in the dessert. 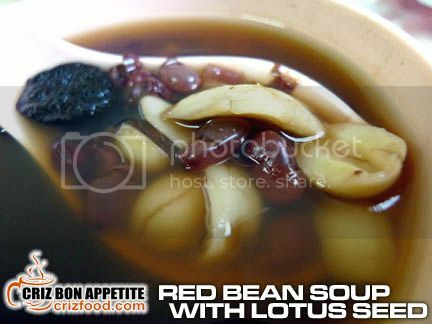 Today, I’m going to share one of my HOMEMADE RED BEAN SOUP WITH LOTUS SEED recipes, which is beneficial to the general health. The red beans or commonly known as the azuki bean, are a good source of magnesium, potassium, iron, zinc copper, manganese and B vitamins. These beans act as a natural diuretic and help in reducing blood pressure. When combined with some grains, the concoction would supply high quality protein and this would be a great alternative to meat protein. The rich soluble fiber which can also be found in any other beans would help in stool management and also in the elimination of toxins and cholesterol in the body. That’s the reason they are widely used by the Asians to treat problems such as urinary dysfunction, bladder infections and as a diet for post cancer patients (with some other beans such as green beans minus the sugar of course). 1. Get a 5L pot and fill up 3/5 of the pot with water. 2. Wash the beans and rice grains thoroughly to clear any unwanted substance. Pour both the ingredients plus the mildly washed orange peel into the pot. 3. Set the water to boil at high. When boil, turn the fire to medium and cook for 45 minutes (or until you see a small tear on the skin). Add in more boiling water if required. Note: Some beans, especially those older or frozen ones might need a little more cooking time. Just watch out for the tear on the skin if so. 4. Pour in the washed lotus seed and boil for another 15 minutes. Add in more boiling water if required. 5. Pour in the lily bulbs and boil for another 30 minutes. 6. Fill up the pot with more boiling water (4/5 pot) and add in the bundled pandan leaves. 7. Slowly stir in the sugar and let it boil for another 10-15 minutes. 8. Scoop to serve either hot or chilled. It’s the time of the year for fruit feasting as there are lots of fruits on sales just anywhere you go along the roads of Penang. From May until August each year, you would get to enjoy many of the seasonal fruits especially durians – the King of Fruits. The different species of the fruits can come in shapes such as oblong and round with yellow, green or brown husks and the flesh would either be in white, pale yellow, yellow, orange to red. These thorn covered fruits are famous for their large sizes and unique smell that made them the love and hate of many people. I don’t think anyone had created a name for its intruding odor but to some it may just well be the combination of pungent cat pee, musty gym shorts, smelly socks and gas leak. I even heard someone mentioning that his neighbors called in 911 to report a rotten corpse. LOL! Penetrating odor as the nicknames have suggested above, the fruits have the same reputation as the Hong Kong Stinky Tofu – the scent of smell could be overpowering but the scent of taste would sent many floating in heaven. There are many species of durian available in the South East Asian regions of Thailand, Philippines, Indonesia and Malaysia but most of the durian lovers would still prefer those from Balik Pulau, Penang, Malaysia and its surrounding areas as the texture are finer with stronger acquired taste. Thanks to Steven’s contact with the daughter of a durian seller, an entourage of the few of us was able to have the first hand experience in tasting the best of this stinky fruit. 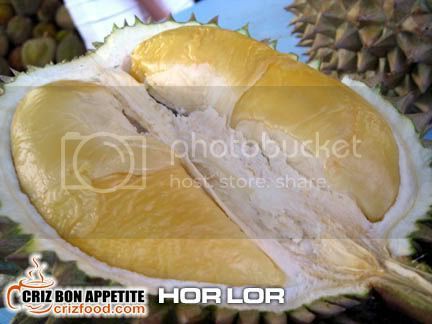 There are many species of durians available here such as Kor Teh (Bitter Herbal Tea), Kucing Tidur (Sleeping Cat), Susu (Milk), Capri, D15, D2, COB, Ganja (Cannabis), Seven Goddess (七仙女), Bak Ewe (Lard), Ang Hae (Red Prawn), Ooi Keong (Turmeric/Kunyit) and many more. We started by tasting the more common ones and later to those award-winning and branded ones. We started with the so called Ooi Keong Ong (Turmeric/Kunyit/黄姜王 – approx. RM10). It was fibrous, custard creamy and sweet with a hint of fermented wine after taste. Although the fruit was filled with lots of meaty flesh, it was just average to my taste bud as it lacked the strong aromatic taste of durian. Even though so, it would still be ideal for general consumption as it was rather filling. 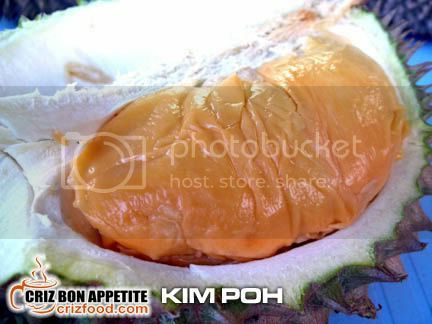 We were then given a test on our preferences for the following two branded durians of almost the same quality – Hor Lor versus Kim Poh. Comparing the colors of these two different species, Kim Poh (Golden Treasure/金寳 – approx. RM15) had a more inviting color of mixed orange and yellow. Taste wise, it had a smooth creamy and custard like flesh with slight bitterness. To me, it was a bit over ripe but that was the uniqueness that made the fruit having its strong fermented wine after taste and likeable by many. 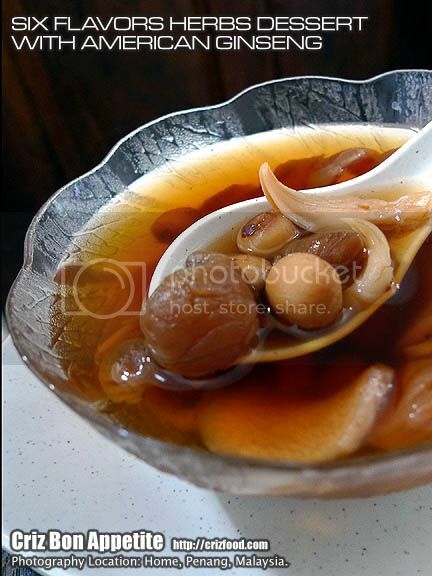 The moment everyone tried the Hor Lor (Calabash/葫蘆 – approx. RM15), there was a moment of silence as everyone was enjoying the beauty of the taste. The flesh was so smooth that it just melted in our mouth like ice cream. The creamy sweetness and bitter end taste obviously showed which species won the contest. Thumbs up for Hor Lor! 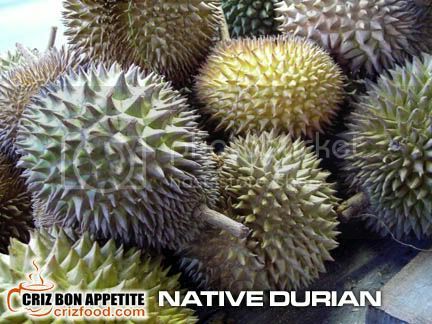 The next durian which was the Chneh Poay (Green Skin/青皮 – RM8-RM20) tasted more like native durians as it did not have much of the durian flavor “strength”. More fibrous compared to the rest, it only taste sweet towards the end nearing the pulp with more obvious bitterness. 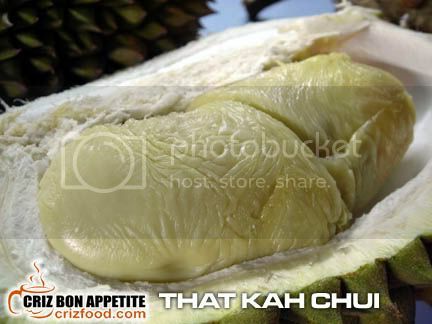 I thought the next durian served was the laugh of the day – That Kah Chui (Stuffed Buttock/塞屁股 – approx. 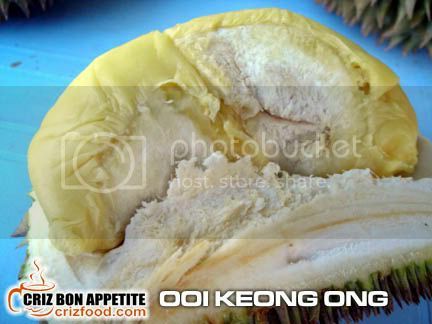 RM10) but that was indeed the name given by Ah Joo for this native durian (durians from the older unnamed trees/土蓮). 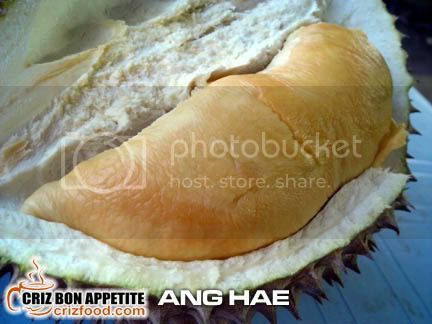 This was just another typical native durian with thinner flesh and larger seeds. 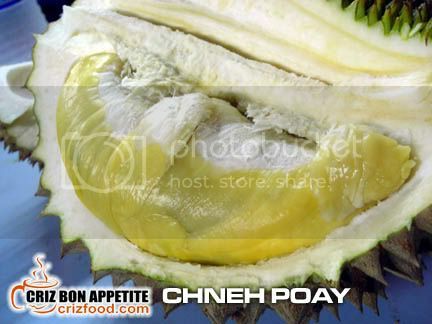 Although sweet with fine texture, it definitely would not satisfy my craving for better and more fulfilling durians. I’ll need more meaty flesh, regardless of branded or native as some native durians could taste far better than branded ones. 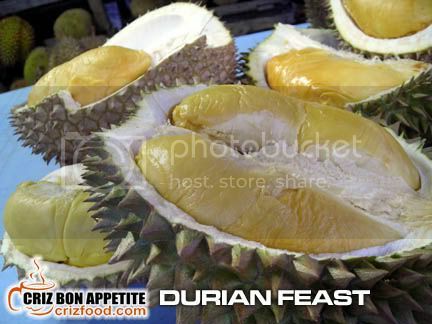 Here are a shot of some native durians which you could get a large bagful for less than RM20. The Man of Honor aka Ang Hae (Red Prawn/紅蝦 – RM10-RM30) came out last as we had had decided to save the best for last. The fruit was indeed the best as it has won many awards in the local durian scene. The flesh was the finest around with smooth custard like creaminess. There was the distinctive sweetness and wine taste with a slight touch of bitterness. I would recommend this species. There’s a secret when consuming Ang Hae. The fruit should not be eaten once collected from the plantation. It should be left aside for a few hours to enable it to gather that powerful “booster”! On top of having durian fresh or having them with steamed white glutinous rice topped with thick and slightly salted coconut milk and fine sugar, there are many other by products available here such as the local durian paste cake (durian kuih), dried durian meat cracker, durian cream cake, coconut durian glutinous rice cake (dodol), durian ice cream, durian nian gao (glutinous rice cake available during Chinese New Year) served with shaved coconut, etc. Phew! There are just too many to mention here. For me, I love to have the seeds roasted or boiled until cooked. They tasted just like chestnuts. Wonderful! However, when you have the King of Fruits, you would also have the Queen of Fruits during the season – Mangosteens (RM2/kg or RM5/3kg)! These proud looking tangy and peachy flavored ladies in deep purple dresses with Brazilian party like greenish headgears and white pinkish undergarments have been believed to be the antidote for those who had consumed too many of the “kings”. 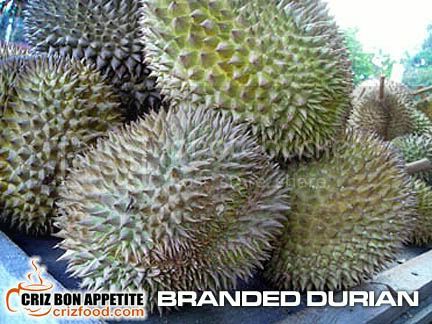 Its nutritious richness and antioxidant strength would surely compromise with the sugar level, carbohydrates, protein and fat that of durians. Isn’t it great to have the “cooling effect” of mangosteens versus the “bodily heatiness” of durians? But have a pair of watchful eyes when peeling as the purplish natural dye from the fruit might stain your attire terribly. The edible endocarp of the mangosteen would normally have few segments of so called wedges like flesh. The bigger ones would have seeds. At the bottom of the exocarp would be some embossed wheel spokes like ridges. That would determine the amount of “wedges” the fruit will have within. Other than the kings and queens, we have the hairy like fruits called Rambutans (RM2/kg or RM5/3kg). These fruits may come in many colors such as red, yellow, reddish green, green (unripe) or maroon (shorter hair). The species sold here were from Balik Pulau, Penang. 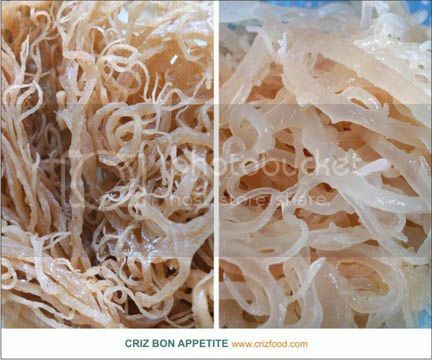 They have thinner skins with a much thicker coconut crunch like texture. The taste of rambutans would be somewhat different compared to other tropical fruit as it has a unique mild acidic sweetness. Some older generations might even pickle them in salt. It actually tasted real good as pickles. One advice for those with asthmatic or throat problems – Do not take the fruit with the skin from the seed intact. It would cause continuous irritation to the throat. Another tropical fruit that would be quite famous, especially amongst the Malays would be the Buah Langsat (RM2/kg). These fruits are normally oval in shape and would come in bunch of 30 fruits or less. The yellow and leather like skin fruit has 5-6 peels of translucent juicy flesh inside. Just like the mangosteen, it has whitish like seed in bigger peels. As for taste, it has a sweet and slightly sour acidic flavor with a hint of bitterness if not fully ripened. Last but not least my so called Prince of the Fruits – Cempedak (RM3/kg). The sausage like fruit practically grows on the trunk of the tree. The unique South East Asia native fruit has red, orange and yellow arils and taste somewhat like a stronger jackfruit with a hint of durian (without the intruding smell of course). I actually wanted the stronger and sweeter fruit with red arils but it would take a month or two more before they would be available. We ended up with the yellow ones which tasted just as great. Although some people would love to have them fresh, my favorite teatime snack would still be the double batter fried ones. Why double batter fried? The first batter dip would be to get the flesh cook and the next batter dip would get the seed within cooked well and to give that extra crunch. Just like the durian seed, the cempedak seed has the unique chestnut flavor but a bit softer than the former. I would surely archive Ah Joo’s contact for the remaining months and also for years to come as this has been one of the great fruit stalls around. Even their Buffet Durian Promotion (5-10pax at RM25/adult and RM15/child) shone out amongst the rest as there will be unlimited supplies of branded durians for your consumption. If you feel like having a durian fiesta right in the comfort of your home, delivery service can be arranged for an order of more than 10 fruits. Do check out the delivery time below. Finding the stall would not be hard if you know how to get to the Penang International Airport by using Jalan Sultan Azlan Shah. 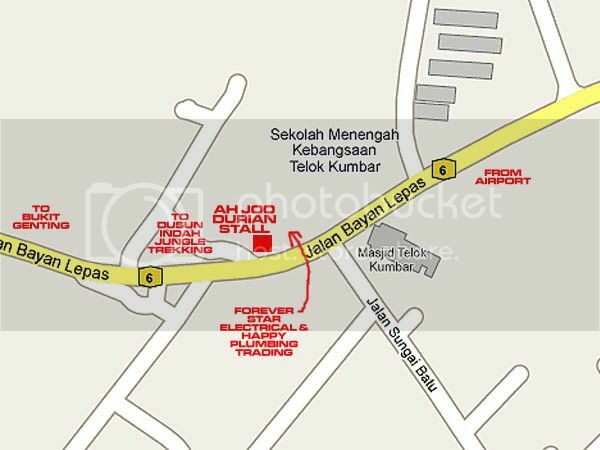 As you reach the airport entrance “Y” junction, turn right and go over the flyover into Jalan Bayan Lepas. 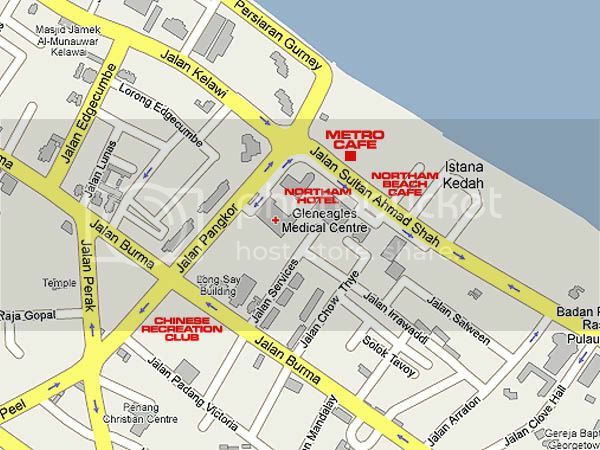 Drive on until you have reached the Jalan Permatang Damar Laut junction. Drive straight until next prominent landmark which would be the Emerald Park/Krystal Country Homes on your left. Drive further until you see the Teluk Kumbar Mosque, Kampung Sungai Batu. Slow down and watch out for Ah Joo’s Durian Stall just a few meters away on your right next to Forever Star Electrical and Plumber Trading. 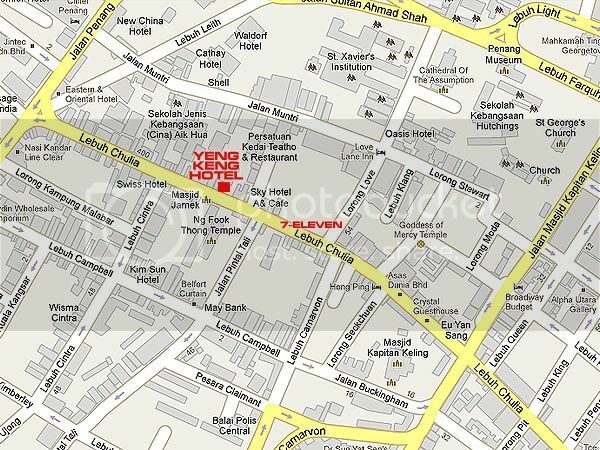 Branch Address: 1238 Jalan Bayan Lepas, 11900 Penang, Malaysia. Although I do get my Mum the best food around town frequently, it was a special day yesterday to bring her out for some live-on-the-spot dinner. After all, it was Mothers’ Day and she ought to be treated like a queen. We ended up having Japanese food at Nippon Yataimura which is located in Pulau Tikus, Penang. From the exterior, it looked like a normal restaurant. As we stepped inside, it was totally another world by itself with lanterns hanging everywhere on little roofs just like in a village. Now I got it why they had named the shop as “日本屋合村”, meaning Japanese House in a Village. There were just too many choices available in this restaurant with even a specially created 9-course set meal priced at RM48+ just for Mothers’ Day but we ended up ordering some other set meals with a few dishes from the Ala Carte menu. Let me share with you the set meals that we had ordered. 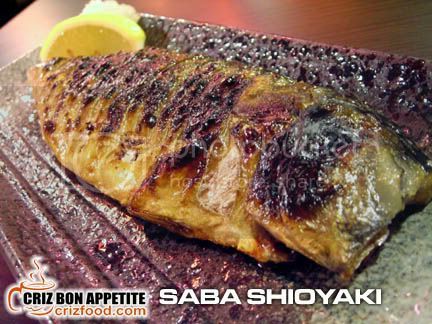 One of the set was Saba Syioyaki (RM25). This is one of the most ordered fish dish in Japan where a small mackerel was grilled to perfection while maintaining the moisture within the fat. The fish had a nice grill and with a squeeze of lemon juice and grated daikon (mild flavored white radish), it was good. Next were two sets of teppanyaki (鉄板焼) style dishes. 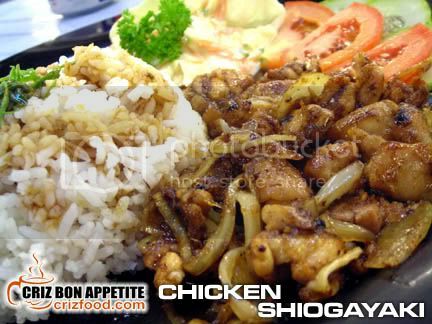 One of them was the Teppan Chicken (RM20). The dish came with some iron griddled mixed vegetables with some toasted garlic slices. The chicken slices were good with their special sauce and they tasted a bit like the spicy version of sate. 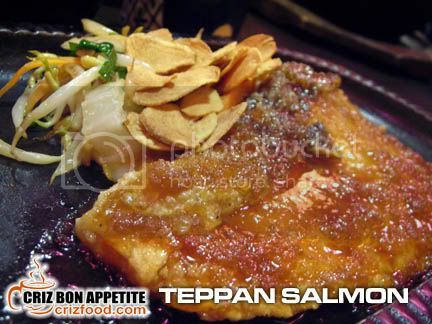 Teppan Salmon (RM24) was the other wonderful dish as the sauce was somewhat unique. It was slightly sweet and mildly spiced up. Even with the crisped sensation I had, the fish managed to retain its juice. It was beautiful. Something caught my eyes in the set menu and I ended up ordering Pork Mayonnaise (RM20). The dish was real creamy with the flavors coming from the mayo and a hint of Lea & Perrin sauce. This dish was cooked with lots of sliced big onions. This would be good if taken with rice. The above four sets came with side dishes such as a bowl of beautifully steam Japanese rice, Salad, Miso Soup, Chawan Mushi and fruit cuts. The Salad had a mildly gingered chili paste. The Miso Soup was thickly flavored with some tofu cubes and chopped spring onions in it. The Chawan Mushi (Steam Egg) came beautifully decorated and was silky smooth with a few chopped chicken meat pieces within. Other than the above set meals, we also tried the Seafood Fried Rice (RM22). The dish came with freshly cooked squids, prawns and fish fillet. Although the taste of the rice was nice, I found it to be wet for my preference. It could be due to my liking for “wok hei” (high heat cooking) style of plain white rice rather than the usage of Japanese rice. 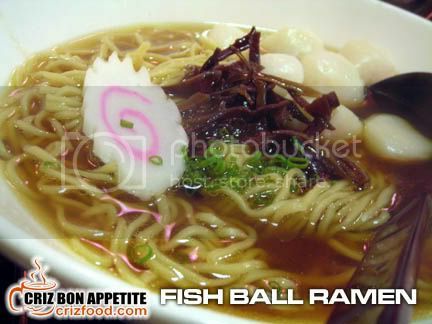 The next dish which was the Fish Ball Ramen (RM13) may look plain but one sip into the soup and you would yearn for more. The soup was richly flavored with a hint of fresh prawn juice. It was just like the Dobin Mushi I had at Penang Times Square. Even the portion of ramen served was rather filling. 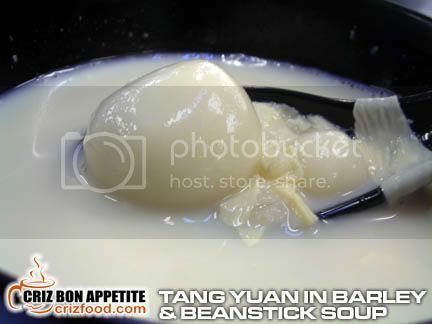 The dish came with fish balls, sliced wood ear fungus and some spring onions. 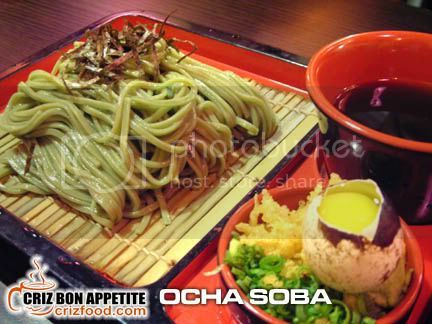 We also ordered some of the dishes from the Ala Carte menu and one of them was the Ocha Soba (RM13). We had a small serving of cold noodles served with cold soup, raw quail’s egg, spring onions and chopped fried garlic. We indeed left the quail’s egg untouched. One reason was that it was raw and the next was the 3640 calories it will bring into our bodies. The noodle was springy and blended nicely with the soup but somehow I still prefer the Tenzaru Soba I had at Penang Times Square as the soup was more flavorful. 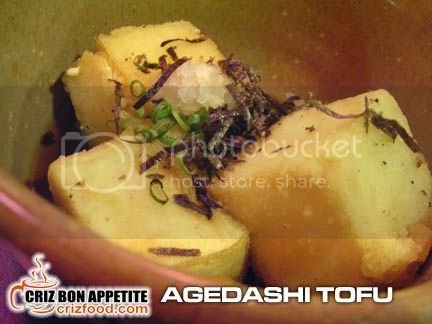 Next side dish was the Agedashi Tofu (RM6). It was nothing special with some pieces of fried tofu garnished with nori (Japanese seaweed strips), spring onions and daikon, served in a pool of soy sauce but the tofu cubes were indeed silky smooth. The Ishiyaki Kinoko Nomori (RM18) was my favorite amongst the rest of the side orders. 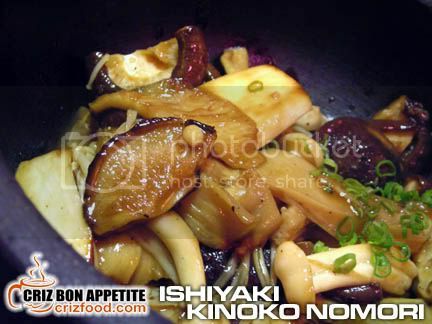 The shiitake (Chinese black mushroom – 香菇) and enoki/enokitake (golden needle mushrooms – 金針菇) mushrooms were stone-cooked so perfectly with their special sauce while maintaining the fragrant mushroom taste. The gravy for this dish tasted great with my rice. Both mushrooms are believed to be great antioxidants. The most wonderful dining experience in this restaurant was their free flow of green tea, either cold or hot at no extra cost. 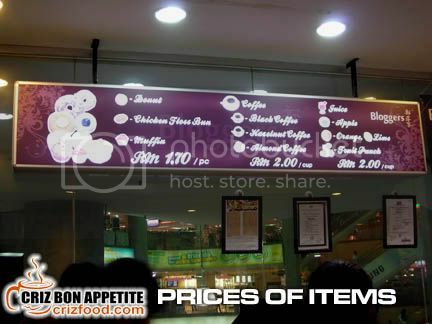 I felt that the pricing here is reasonable compared to the quality of ingredients and portion served. After all, I was really filled up with each set meal I had ordered. The service here was good considering that almost all the food came within minutes upon ordering. There are more dishes which I would love to try out next from their ramen (noodles), gohan (rice), sushi (vinegar rice finger food), sashimi (raw cold cuts) and dessert sections. There is another branch of this franchise restaurant located within Queensbay Mall up in Bayan Baru, Penang. 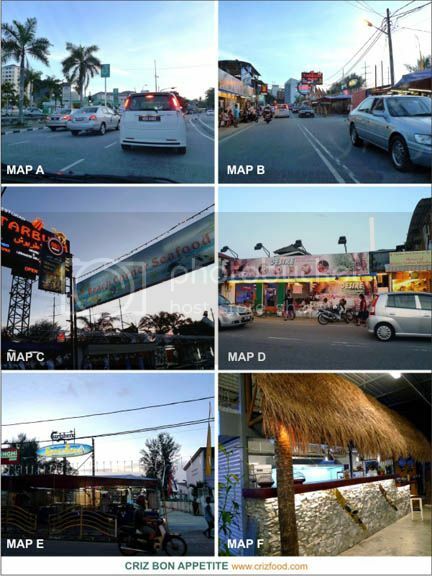 The main restaurant which I had visited in Pulau Tikus, Penang, is located next to a service road along Jalan Burma. If you are coming from Jalan Burma into Pulau Tikus district, you would see a police station on your right. 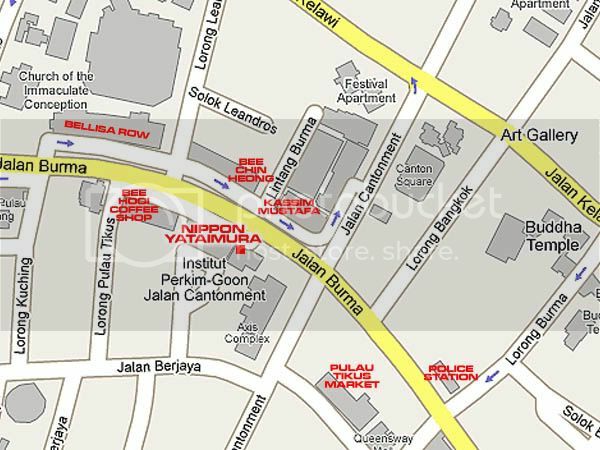 Drive on until you have reached the Jalan Cantonment/Jalan Burma traffic light. After the traffic light, you would see a row of shop houses. Slow down and keep a watch out for a service road on your left. 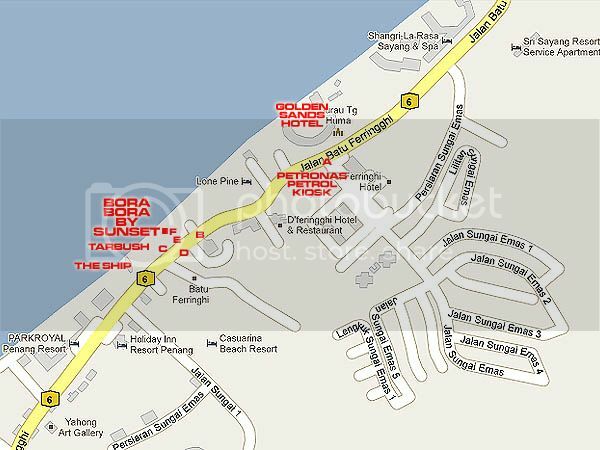 Turn in the service road and you would see the restaurant on your left just next to Teow Chew Meng restaurant. Parking can be quite limited during office hours and weekends. You can either try finding some behind the restaurant or opposite along Bellisa Row. The worst alternative would be within the Bandar Baru Supermarket car park along Jalan Cantonment and walk back to the restaurant. 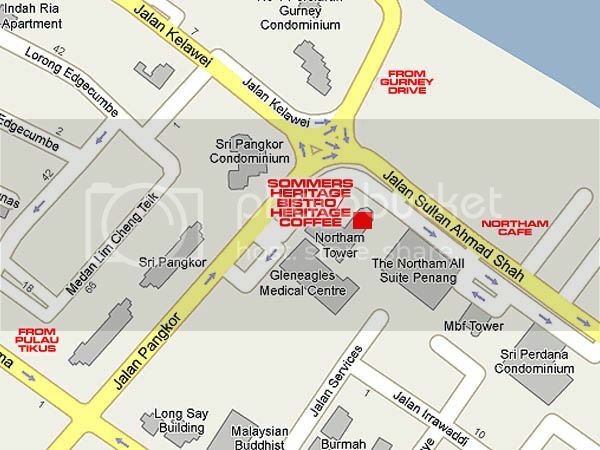 Address: 403-A, Jalan Burma, Pulau Tikus, 10350 Penang, Malaysia.